Sketch and draw when the muse inspires, anywhere, anytime. The pages within these sketch books eagerly receive pen, pencil and light washes. The 75 lb. (110 gsm) paper offers ample tooth for laying down graphite, charcoal, pastel, colored pencil and ink. 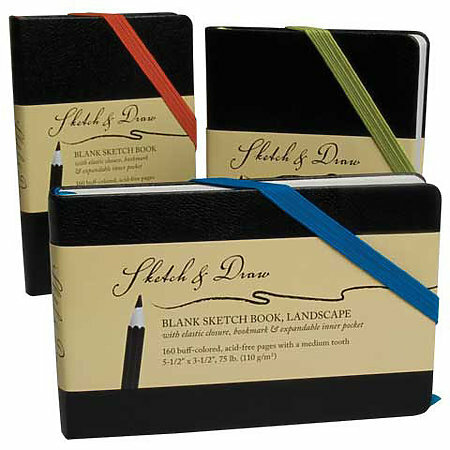 Each acid-free blank sketch book features an elastic closure, bookmark and expandable inner pocket. The portrait books measure 3-1/2" x 5-1/2" and the landscape books measure 5-1/2" x 3-1/2".